Andrew (bunnie) Huang, who won the Electronic Frontier Foundation’s 2012 Pioneer Award (for something different), is currently testing the first version of his open source laptop hardware. It’s about 120mm by 150mm by 14mm nad it has a small battery board so it should be able to fit into an average sized laptop frame (yet to be designed). 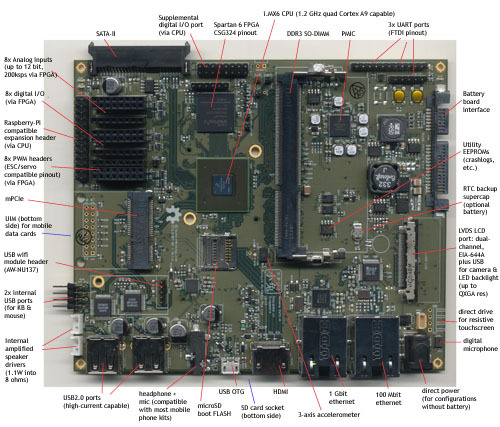 Nearly the entire motherboard is open source; only a couple things required closed source firmware and the board is bootable without them. One of the things I love about open source is that people don’t tend to worry about anything other than the best possible solution. They don’t try to design in some sort of crippling restriction that will lock in customers. Like, for example, Apple arbitrarily redesigning their docking port and then telling developers they can’t use it in their device if it includes ports compatible with anything else. Bunnie not only used a standard SATA-style port to connect the battery and mother boards but he also make the connection for the battery itself a standard molex so you can use cheap, commonly available RC vehicle batteries. At the moment he’s apparently running through the tedious process of validating all the board’s functions, but that highlights another thing I love about open source. Down in the lengthy comments beneath his post it was suggested that he include a physical kill switch for the microphone and camera. Bunnie hadn’t thought of that, but recognized it as a good idea, and is planning to add the feature. It would take a year to get something like that changed anywhere else and that’s assuming the developers ever heard about a good user-submitted idea. If you’ve done any desktop 3D printing and, lets be honest, who hasn’t, right, then you’re aware of the limitation imposed on your creativity by the color of the plastic you’re printing in. Makerbot has sort of addressed the issue with their dual extruder, but it’s really only a tease. Being able to switch from one color of plastic to another only highlights the fact that you can’t print in any of the colors in between. At first people tried to solve the problem by coloring white ABS filament with markers just before it entered the extruder. This approach worked. For example, the Filament Colorizer by cyclone holds two sharpies and makes your prints new colors. Dry erase markers also work, as demonstrated by scocioba. Also RyGuy. As an alternative, James Corbett has developed an extruder that mechanically mixes different colors of plastic. The idea is that you could have a roll of plastic in basic colors (like CMYK and black) that you just push into the mixing chamber in different proportions to create the full color wheel. Testing the marker thing was pretty straight forward. People just rubbed a marker on the plastic filament and it did pretty much what you’d expect. Testing the mechanical mixer was an entirely different story. Corbett went through several passive and active designs before he found one that successfully mixed the plastic. Follow the jump to read the conclusion and way ahead from his paper on the subject. Openalia just posted a video from Ignite in which the founder of Adafruit lists off several open source hardware companies that make real money. As if to put an exclamation point on the idea, Makerbot is expanding into a new building. Not only are they expanding into downtown New York, they aren’t giving up their old space in Brooklyn, so they’ll have over 30,000 square feet to make more awesome stuff. As part of the expansion they’re planning on adding 50 employees by the end of the year. 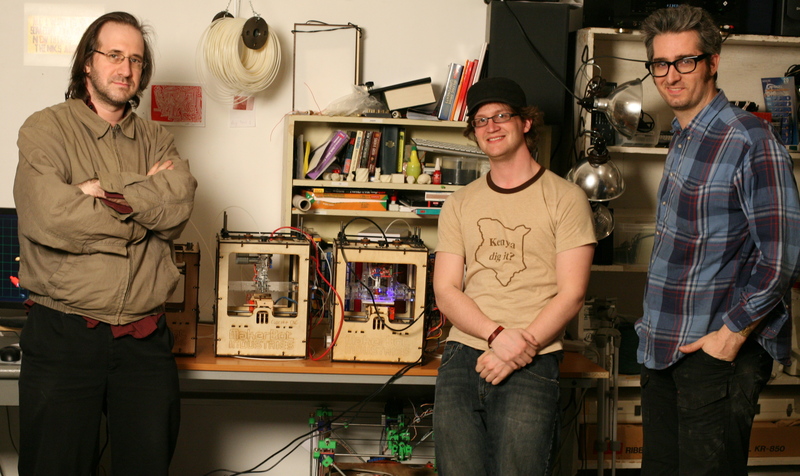 Makerbot started just three years ago. Today, propelled by a rabid base of hobbyists and makers (and more than a little bit of excellent marketing), Makerbot is poised to become the “Kleenex” of 3D printers. When these little machines are as common as microwaves we might just be calling them all Makerbots out of habit. Andrew. (8 May 2012). Makerbot’s New Digs!. Makerbot Industries, Blog. Kusisto, Laura. (7 May 2012). Putting the Tech in MetroTech. Wall Street Journal. Bilton, Ricardo. (8 May 2012). MakerBot makes a big move to Brooklyn’s MetroTech Center. Venture Beat. Faircloth, Kelly. (8 May 2012). MakerBot Picks Up Stakes and Heads for Downtown Brooklyn. Beta Beat. Ipsen, Erik. (8 May 2012). Forest City’s Neighbors Hold Key. The Real Estate Daily, Crain’s New York Business. Brownstoner. (8 May 2012). MetroTech Gets Its First Actual Tech Company. Brownstoner, Blog. City Biz Real Estate. (13 May 2012). MakerBot Industries Relocating Corporate HQ to One MetroTech Center. New York Real Estate. Layton, Scott. (16 May 2012). MakerBot Leases 31,000 SF in Brooklyn. CoStar Group. Mark. (10 May 2012). 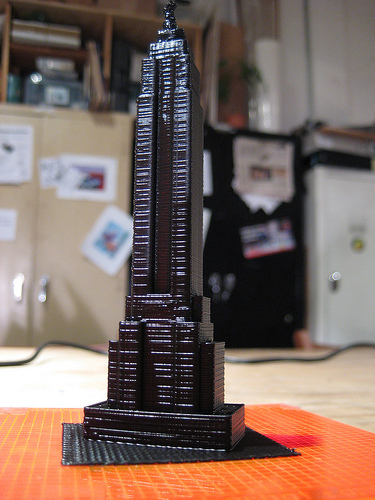 Makerbot grows, takes entire floor of Brooklyn highrise. 3D Printer.net. Rosen, Daniel Edward. (9 May 2012). MakerBot Industries to Print Anything and Everything at One MetroTech. Commercial Observer.